Catalytic asymmetric hydrosilylation based on the use of inexpensive and handleable hydridic silanes is a very useful reaction in organic chemistry which has become the subject of special interest because of the intrinsic peculiarity of economic efficiency and environmental friendliness. Recently, a lot of structurally diverse organocatalysts have been designed and applied to this chemistry. 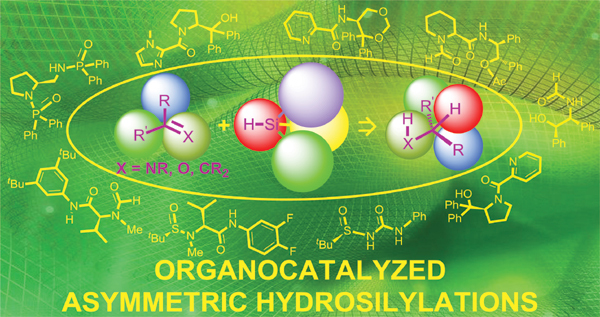 Enantiopure organocatalysts such as formamide derivatives, picolinamide derivatives, S-chiral sulfinamide derivatives and chiral frustrated Lewis pairs (FLPs) have been proved as privileged catalysts for the enantioselective hydrosilylations. This manuscript provides an overview on the most relevant advances in this field and presents an extensive summary of the catalysis performance of the above mentioned catalysts. Asymmetric reduction, hydrosilylations, organocatalysts, hydridic silanes, asymmetric synthesis, Lewis Bases.